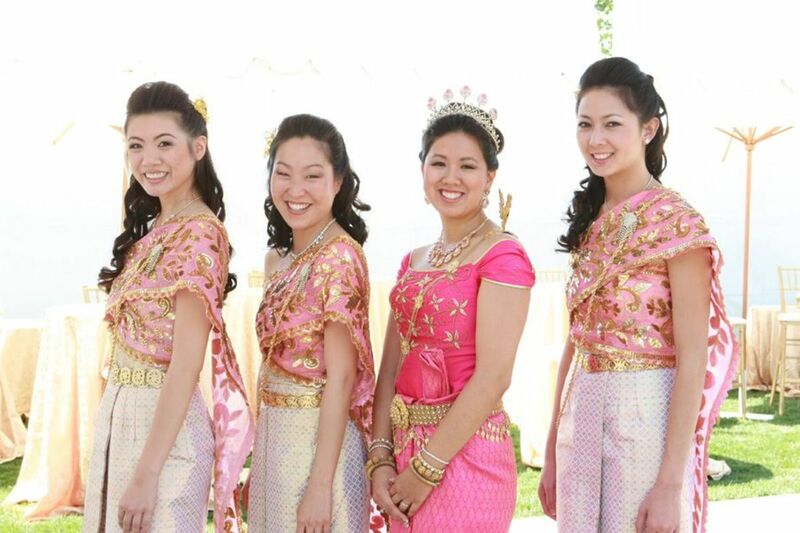 Although I will be detailing many aspects of a typical Cambodian wedding, I am speaking from the position of a Cambodian-American woman, who was raised traditionally but was born in the United States. I married a Korean-American man and English is our primary language. 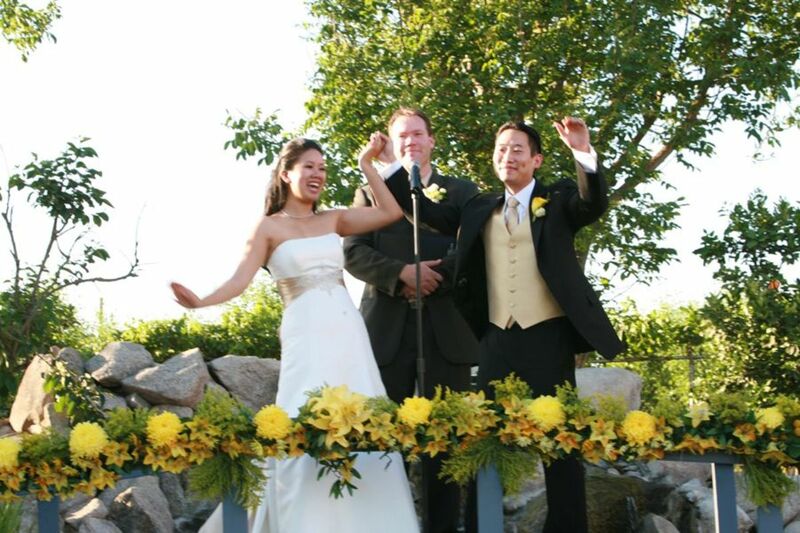 Our wedding ceremonies and reception were a combination of our cultures as well as modern Western-style traditions (e.g. white wedding dress). 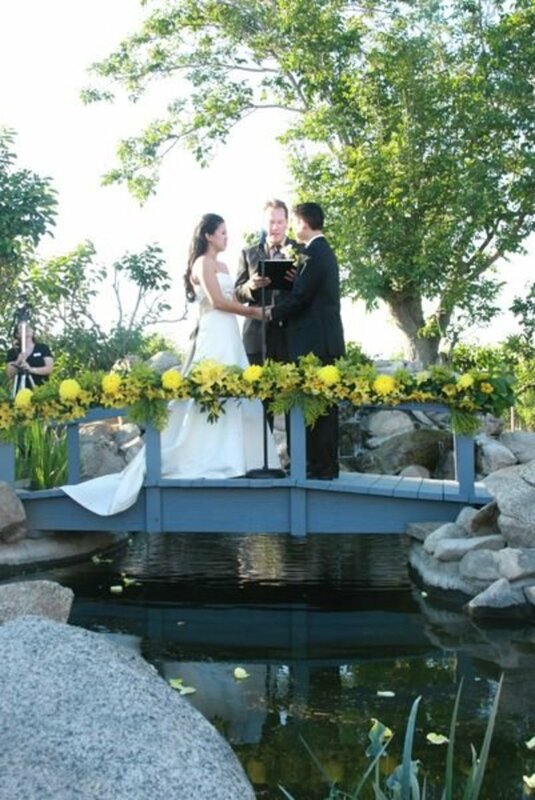 The wedding took place at my family's residence in California, and it spanned two days in the spring of 2008. Also, I use the word Khmer and Cambodian interchangeably. A typical Cambodian wedding is comprised of different ceremonies, lots of music, a dinner banquet, gifts, and, of course, people! Guests are encouraged to not only spectate but also become involved in each ceremony, since an emcee (MC) or host guides everyone along with commentary and instructions (and usually some comedy and teasing too). Music and songs performed on traditional instruments and gongs signal the arrival of the couple to each part of the wedding. 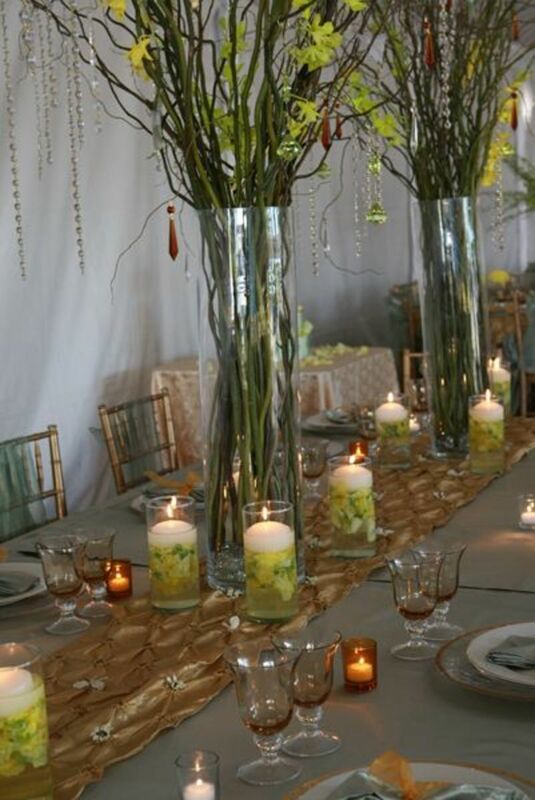 There are usually silver or gold trays, along with candles, flowers, fresh fruit, and other decorations that are placed on the floor or a table in front of the bride and groom. The family and wedding guests usually sit on the floor around the couple, finding whatever space they can (since usually these ceremonies are held at the bride's family residence and space is limited). 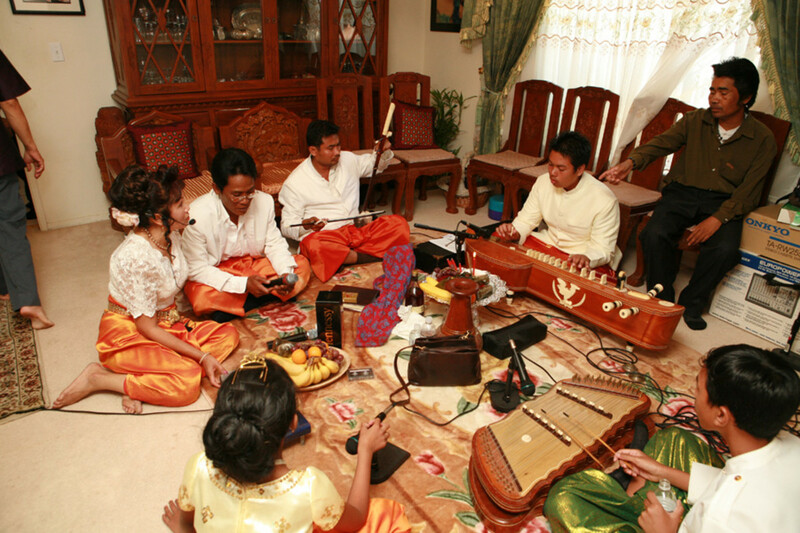 A Cambodian wedding always has plenty of music. 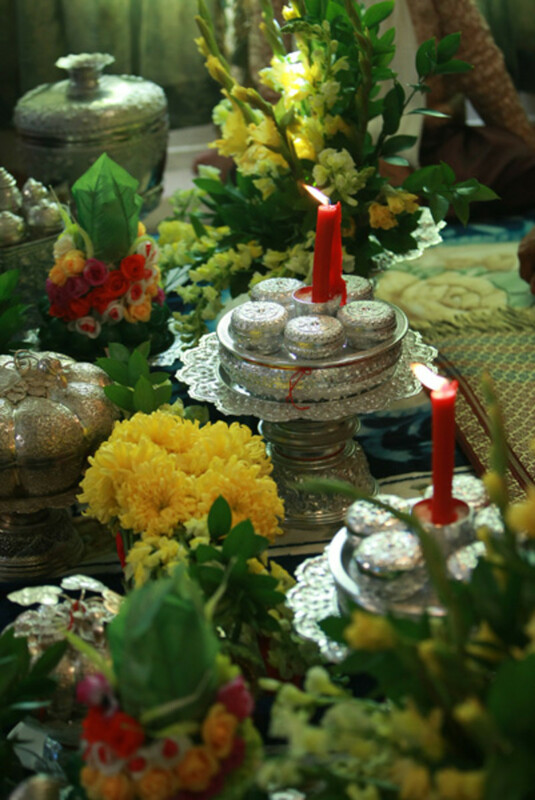 Silver and gold trays are traditional along with fresh fruit, flowers, and candles. The couple is attired in matching brightly-colored silk costumes, and can have a wedding party (groomsmen and bridesmaids) wearing coordinating colors (at my wedding, we each had three attendants). 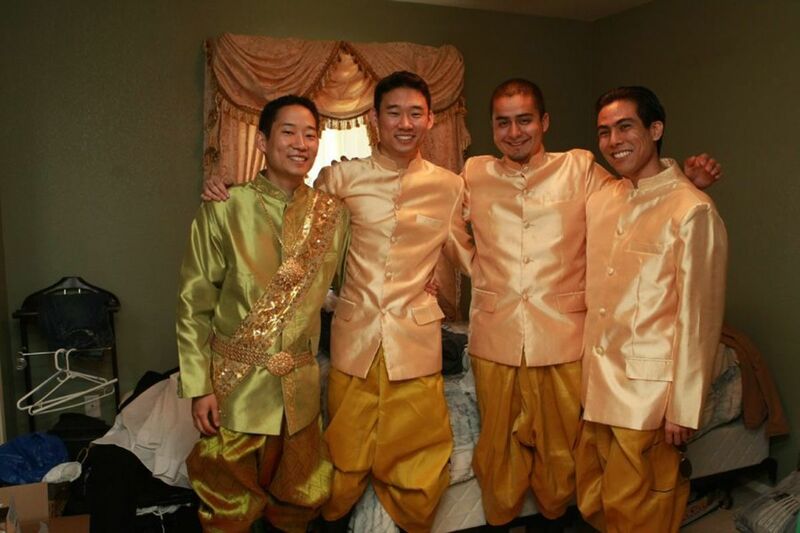 Each ceremony has its own color scheme, so the wedding party has to change outfits in between each ceremony. For the bride, this usually means changing her hairstyle and jewelry (lots of gold!) as well as the dress each time. Though colors and designs vary widely, I believe the outfits tend to get more elaborate with each ceremony, culminating in an opulent all-gold silk outfit to represent the couple being royalty. 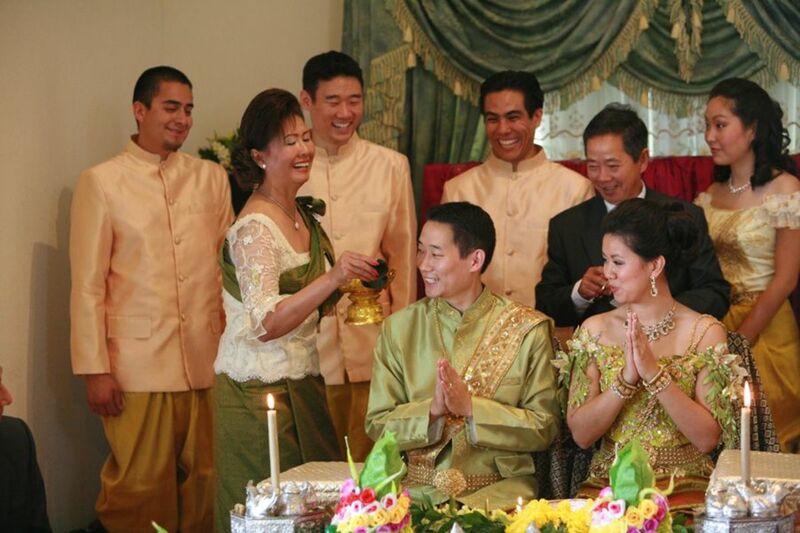 Click here to learn more about the origin of Khmer weddings. Guests normally fluctuate between watching, interacting with the ceremony, and taking a break and enjoying food outside. I have so many fond childhood memories of weddings where us kids would run around and play and eat instead of waiting around for the next ceremony. Indeed, at my own wedding, my friends and even my siblings said they spent a lot of time eating outdoors. This is understandable. Each ceremony is about an hour long, but with all accompanying outfit changes, photographs, and breaks, the ceremonies take all day and are typically spread out over 2-3 days. Unless otherwise noted, all ceremonies take place with the couple (and the attendants) sitting or kneeling on the floor while attired in their costumes. This is usually uncomfortable and boring, but honestly, I only remember the utter delight and sentimentality I felt at getting married and honoring my culture and my family at the same time. 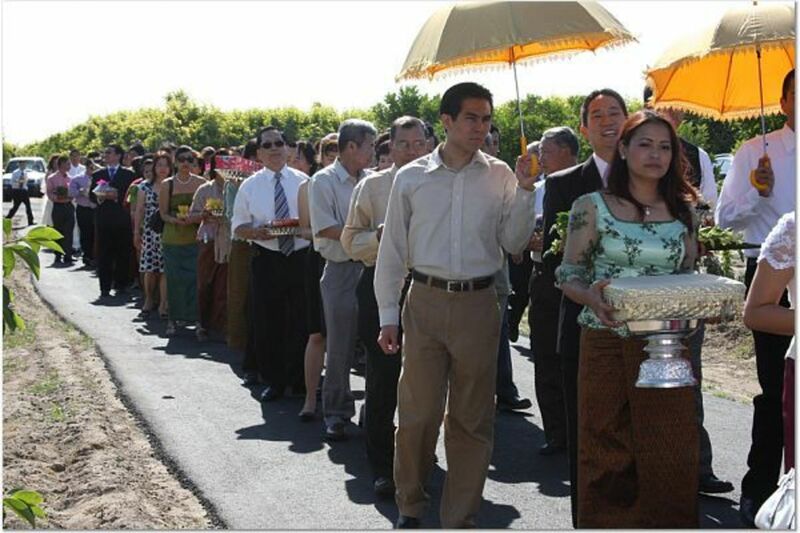 Modern Khmer couples and Cambodian-American families sometimes choose to do only a few of these ceremonies. We may decide to do some ceremonies out of order to fit with the schedule or only invite close family members for the ceremony and have the bulk of the guests just come for the reception. Below, I list descriptions of the ceremonies in the order I utilized for my wedding (Khmer names italicized). The only Khmer ceremony where we got to sit in chairs...the rest of the time, we sat or kneeled on the floor. This is an often skipped ceremony in the US, but I felt it was important since my family is very traditional and religious (we are Buddhist) and I had missed out on a lot of visits to temple (wat) over the years. 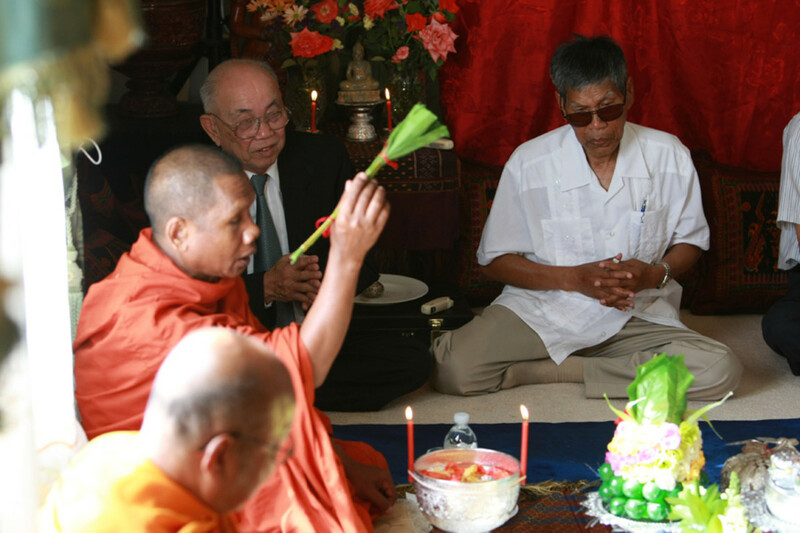 During this ceremony, monks bless the couple and the attending guests (usually close family) by sprinkling everyone with flowered water while chanting their specific blessings. This is a solemn occasion, and guests and the couple remain quiet with their heads bowed and their hands in prayer. We didn't have our wedding party in Khmer costumes at this ceremony, but we wore traditional matching silk and embroidered outfits (blue bottoms and white on top). My groom said he couldn't keep his eyes off of me since this was the first time he'd ever seen me in Khmer costumes and very dramatic makeup and hair. Monks bless the guests by sprinkling everyone with flowered water. The couple remains quiet, with their heads bowed and hands in prayer. Despite the solemn occasion, my groom couldn't keep his eyes off me! 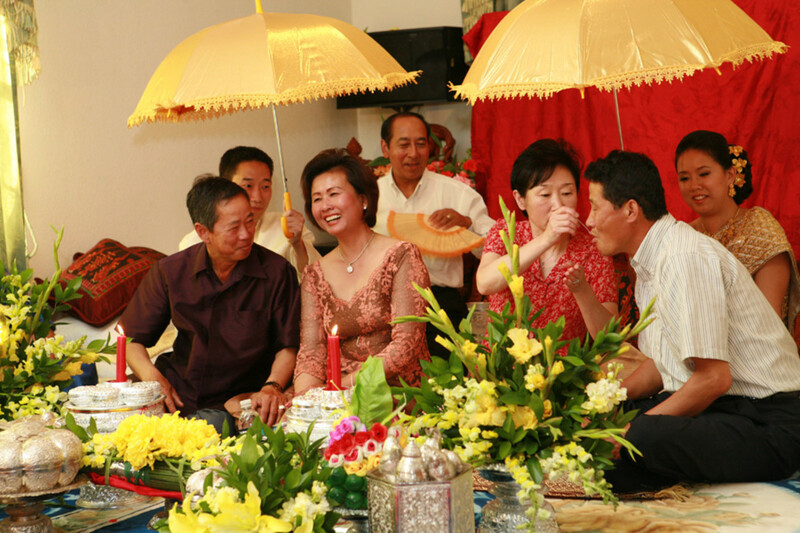 Translated as "holding umbrellas over parents," this ceremony honors and thanks the couple's parents by reversing their roles. As their parents have taken care of them over the years, now that they're marrying, it is the couple's turn to shield and take care of their parents. We provided fruit and sugar to our parents as we held golden parasols over their heads (for almost the whole hour) while the MC talked about our responsibility to take care of our parents. The bridal party does not dress up for this ceremony either since it's about the couple's duty to their own parents. My groom and I wore white and light gold silk outfits. Other than a rehearsal for the American wedding ceremony, we had no other ceremonies on Friday. We had just had a taste of the Khmer ceremonies; the bulk of them would be held the next day. I sat behind my in-laws, while my husband shaded my parents with the umbrella. Our white and light gold silk outfits. The groom comes, literally bearing gifts, to the bride's house to meet her family and see the bride. The parade is usually the first ceremony of the day. 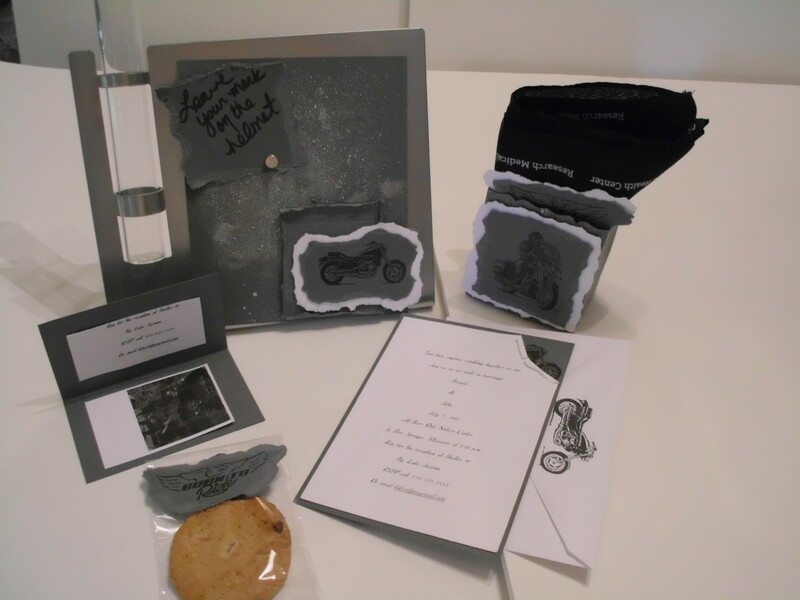 Guests are handed matching silver trays of fruit and gifts as they arrive so they can join in the parade, following the groom on his symbolic journey to the bride's house (usually a short distance around the block). At our wedding, after the trays were brought in and arranged on the floor, a young Khmer girl danced and sang among the gifts to showcase the bounty of offerings and richness of the groom's family. We also did a ring exchange at this time (although in our Americanized hearts, we weren't truly married yet since we did not exchange vows). My groom just wore his suit this time, while I was in a bright pink outfit and matching tiara. The groom's parade goes to the bride's residence. My groom wore his suit, and I was in a bright pink outfit with a tiara. The bride and groom pay homage to their ancestors by lighting incense, bowing, and offering food and tea, usually to a photograph or altar dedicated to their deceased ancestors. It is also known as a "call" to ancestors to come and view the new family bonds that are being formed and to bestow their good wishes or blessings upon their living family. Khmer people usually do this at every important occasion or event, like the lunar new year, baby welcoming parties (1-month birthday) and harvest moon festivals. We bowed and offered food and tea to our ancestors. My beautiful bridesmaids and I in lovely shades of pink. The words are literally translated into Cutting Hair, but the symbolism of this ceremony is to cleanse the couple of the past and get them ready to start their new life together. For this ceremony, the couple sits side-by-side in chairs. Two Khmer singers (one man, one woman) who represent heavenly beings dance around and symbolically cleanse the bride and groom of their past. They do this by simulating cutting the couple's hair and pretending to perfume them, all the while telling jokes and teasing the couple. Then family and guests, such as the couple's parents, will take turns at doing the same (cutting hair and spraying perfume). Some guests get carried away and spray too much perfume instead of just miming it. Thankfully, no real hair is cut off! This is my favorite ceremony because of the interaction and humor involved (and maybe because we got to sit in chairs instead of kneeling on the floor!). We wore matching light green silk outfits. 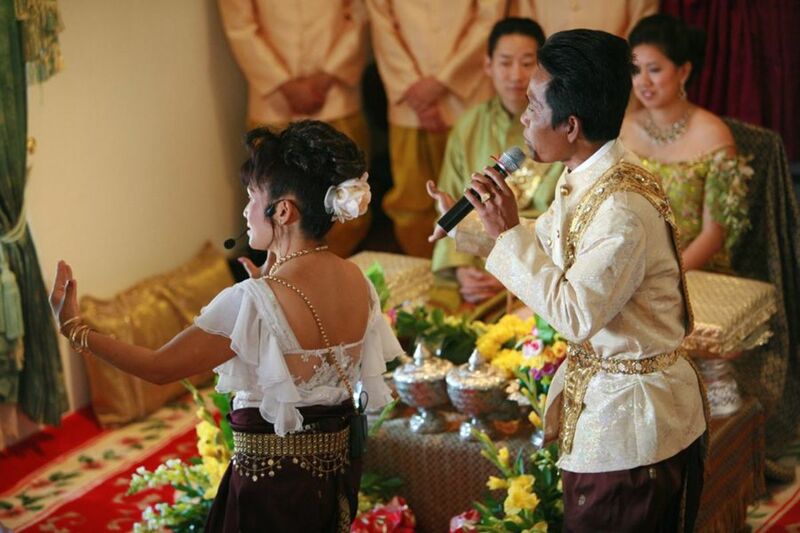 Two Khmer singers, representing heavenly beings, symbolically cleanse the wedding couple of their past. They simulate cutting hair and perfuming the couple while telling jokes and teasing them. Friends and family also get to participate. Some of them go overboard with the perfume! My husband with his wedding party after the hair-cutting ceremony. The couple kneels in the middle of a circle of already married couples. 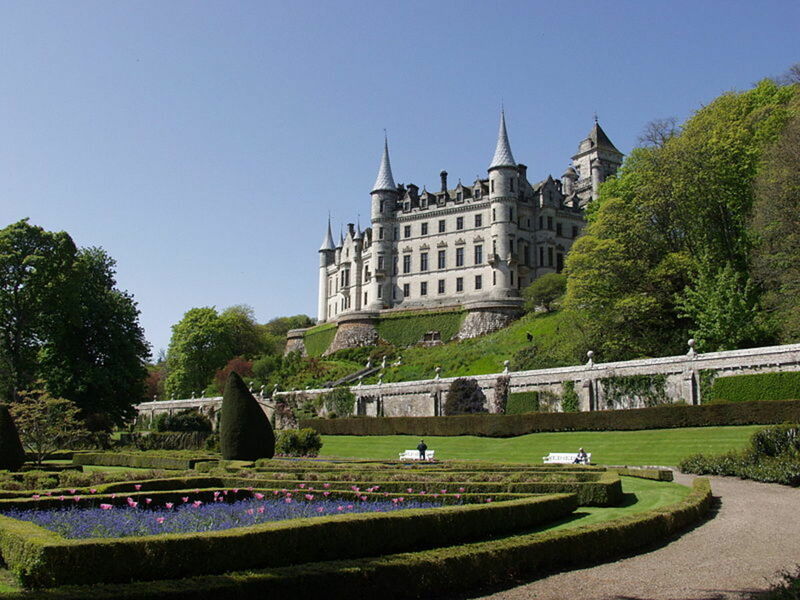 Three lit candles are passed around seven times clockwise and their smoke waved towards the new couple. This is to represent the passing of blessings or essence from the happy, successful married couples to the new young couple. 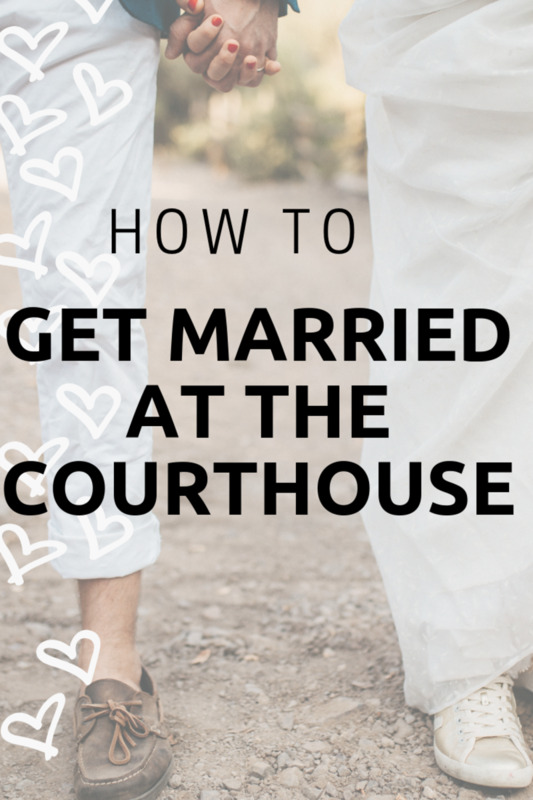 It's a great way for guests to be involved because it doesn't have to just be family; your close married friends can also take part in the ceremony. Unfortunately, I don't have any good photos of this part, but I remember we were wearing our gold outfits. Aren't we cool? Decked out as a royal prince and princess. Right before this ceremony, the entire wedding party walks in a circle around the area where they will be sitting while the groom brandishes a sword in protection of his new bride. During the ceremony, the couple kneels down while holding the (sheathed) sword in between their clasped hands. Guests come up and tie red strings around each of their (the bride and groom's) wrists. Sometimes money is given as a gift at this time too. This ceremony is all about each guest having a chance to personally bestow blessings or well wishes on the couple, and at the same time get a photo with the couple (but, as at any wedding, photos are taken at every opportunity all day long, especially since there are new outfits to marvel at each time the couple comes out). At the end, guests throw pka sla, or the white seeds found in palm tree pods, which are a traditional element in Khmer weddings. The couple kneels while holding a sheathed sword as their guests bestow blessings by tying a red string around each of their wrists. Everyone takes photos with the couple. 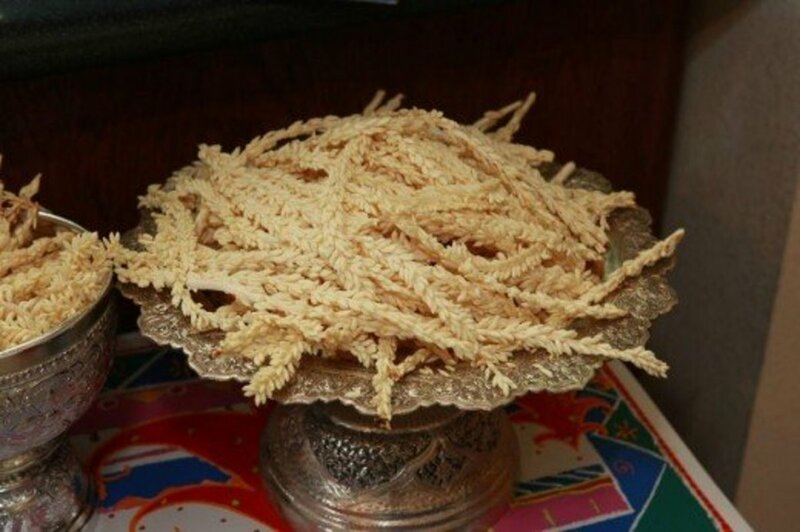 Pka sla, the white seeds found in palm tree pods, are a traditional element in Khmer weddings. We decided to do an American/Western-style wedding ceremony after the Saturday morning Cambodian ceremonies. This involved an officiant who read our vows, which we repeated to each other (the "for better or worse" type of vows), an exchange of rings, a butterfly release, and a kiss. Then guests enjoyed a cocktail hour (with drinks and appetizers) while the wedding party took pictures. We greeted our guests in a reception line, gave them flower corsages, and they entered the reception (which took place outdoors, but under a wedding tent). We had about 300 guests at our reception. A Cambodian style wedding reception is a banquet that involves a 10-course meal, drinks, and dancing (like a Chinese wedding banquet). At this time, as in the Chinese tradition, gifts of money are usually given to the bride and groom to allow for a great start to their new life together. Actual presents, or a gift registry, is a foreign concept in Cambodia, but with modern couples, any gift is appreciated. Since I had many non-Khmer guests, I decided to do a gift registry at a popular department store (Macy's), but the physical gifts we received were greatly outnumbered by the monetary gifts. After traditional Western-style moments, like the garter toss (my grandmas were gleefully embarrassed to witness this) and bouquet toss, baby photo slideshow, toasts, and cutting the cake, my husband and I changed into our "hanbok" which is traditional Korean wedding attire and formal wear. In our outfits, we went around the tables to greet each guest and give out wedding favors (a silver box in an organza bag). This is when the guests give us their money gifts. 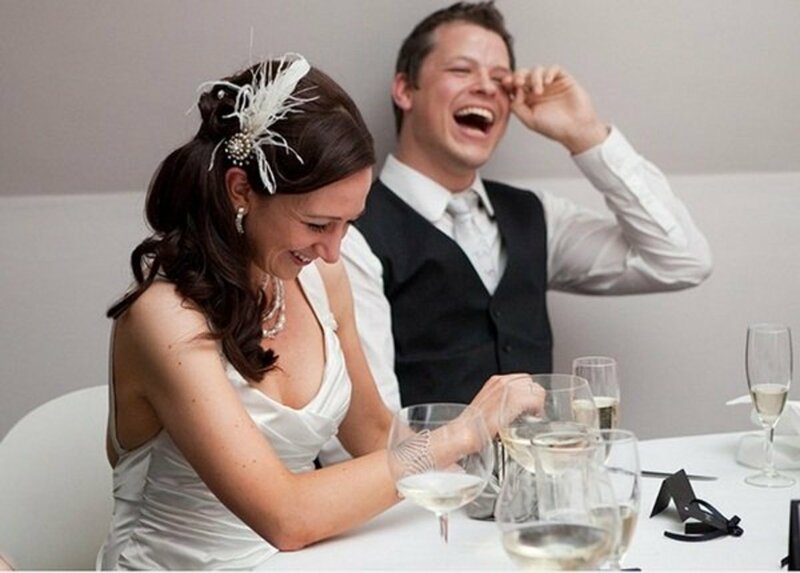 At a rowdy wedding, some guests will make the newlywed couple complete tasks (like drink a shot of liquor) or exchange kisses in order to get the money gifts. However, most guests just want to wish the bride and groom happiness and blessings and hand over their gift. Most of the money we received went to paying for wedding expenses (that my family incurred) but there was a tidy sum left over for my new husband and me to keep. Let's just say it was enough to cover the honeymoon, new furniture, and a few month's rent. Thank you, my family and friends! This was just after we exchanged our vows. The tables at the reception. 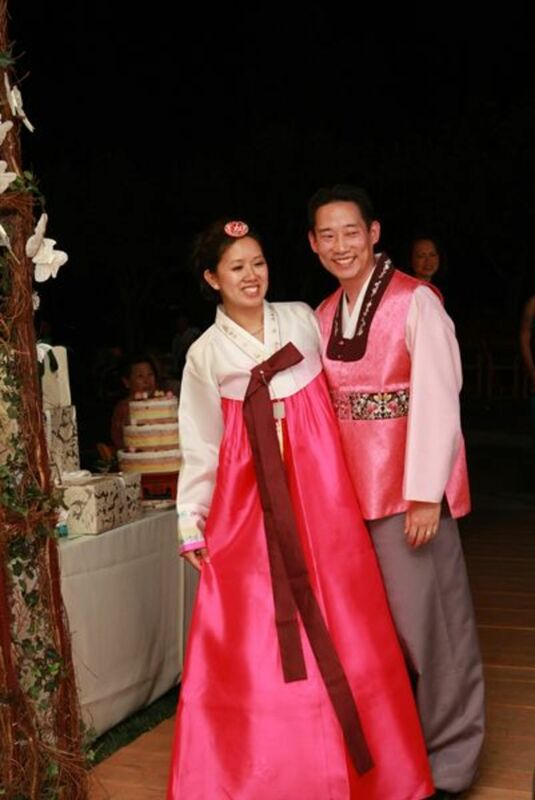 My husband and I in our traditional Korean wedding attire. To cap off the night, we danced all night long to modern pop/techno music performed by a Khmer band. It was so much fun dancing under the stars (the dance floor and stage were not under a tent), and the party wound down by 11 pm. In summary, we started our Khmer ceremonies on Friday around 3 in the afternoon. We performed more Khmer ceremonies starting at 9 am on Saturday, until about 2 pm. After a short break, we got ready again and had our American-style ceremony starting at 5:30 pm. We had a cocktail hour and made our entrance into the reception, which went on from 7-9 pm. Finally, it was dancing (and drinking) for the rest of the night. I have such good memories of our wedding and am so happy to share them with everyone. I hope you've learned a little something and enjoyed reading! Thank you! Thank you for sharing a very detail of our culture and of your beautiful wedding ceremony which releases the imprint of long and descriptive in English word so that we can explain foreigners to know about our culture in a better English base. I loved the photos and video. Thank you for sharing this piece of our culture in the online community. Wow. I and my partner are Cambodian-American too. We love your videos. We plan to honor our roots as well. Your pictures are so beautiful, they are inspirational. 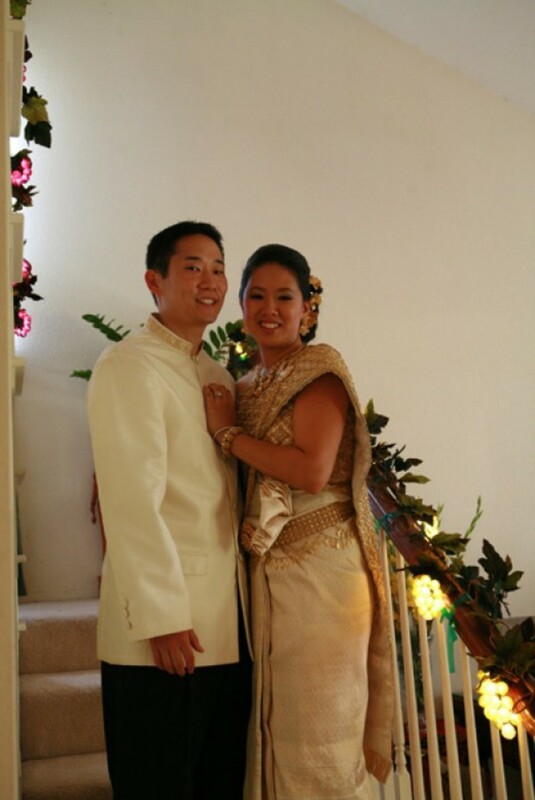 I rented the Khmer bridal costumes from a shop in Long Beach, California. Just search khmer bridal shop or khmer wedding costumes. They also do custom dresses and tailoring. Good luck! Hi lovely wedding, i was wandering where did you rent the outfits from. I can seem to find info on it. Thank you again for sharing this beautiful wedding and celebration! always happy when i read stuffs like this and am prompted to do such things. but i believe soon enough i will. good one. It's such an interesting wedding service, and I was so completely confused and lost for most of it, lol. I love Khmer culture. I stumbled upon your hub and was immediately impressed by your story. First of all, you looked so beautiful! What impressed me the most is that your celebrations incorporated the joining of three cultures, ( American, Cambodian and Korean), so well. Your images and slideshows were very effective in showcasing your special event. Great article! Thank you for sharing. Wow, What a wonderful wedding. Every thing mentioned in the hub is really very wonderful and mind blowing. Both of you look so good in your various costumes. The pictures included are beautiful and stands close to nature. I wish you are having a very happy life with your two kids. Thank you for this beautiful and informative story. Looking forward to attending a Cambodian wedding next weekend. Wish you both all the best for your life together. Wow, what awesome pictures! All the colors are so spectacular...and I love the Monk's Blessing that you described. Many best wishes to you for a lasting and beautiful marriage. What a beautiful hub and wedding clothes. 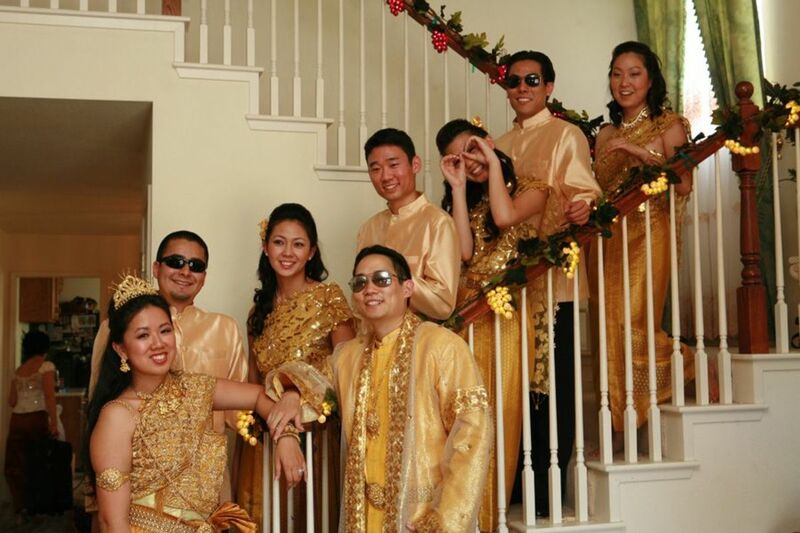 Thank you for giving us a taste of what it's like to attend a Khmer wedding ceremony. So interesting. Your wedding pictures are beautiful. you have very hansom children and your writing is good. Cool I'm going to a cambodian wedding soon so this will help! Thanks nice wedding!!! Good on you. 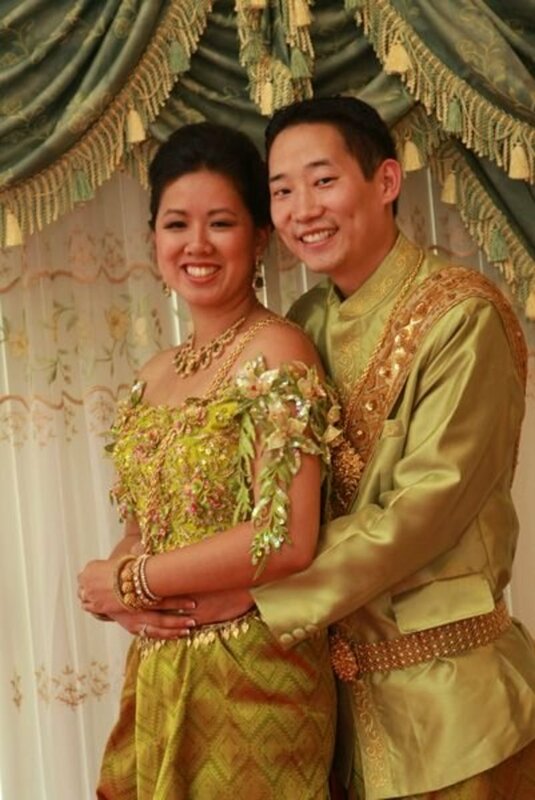 first time, I found Cambodia's wedding look alert and real one. as I am khmere, I feel very proud of your traditiona Cambodia's wedding. I'm sorry I've been so busy lately...I thank you all sincerely for taking the time to read about my wedding and my culture. I hope you liked it or learned something about Cambodian weddings! One day, I'll upload some real video, not just photos, of the ceremonies, so you can hear us speak Khmer, listen to the traditional music and get more of a sense of the ceremonies in real time. Thanks for your kind words!! P.S. LOVED the slideshows too! yes,it's a popular in cambodia .it's pretty and beautiful.i hope it popular in future and we all not forget it. Yes, I saw the pix of babies on your blog. OMG! Those faces are so cute --- just like Mom and Dad :-) Take care of those blessings. Thank you for your kind compliments...I read these to my husband and he smiled :) We had such a great time celebrating our wedding. We're nearing our 4th year of marriage but have been together over 11 years (so you can see why we looked so happy after such a long wait!). We now have two sons and couldn't be happier. I'll try to visit all your profiles and hubs as soon as I can. Thank you for reading and following! Amazing wedding! You both look so beautiful!Thank you for posting it. Congratulation for the Hub of the Day award. OMG . . . awesome ceremony. Congrats on your "Hub of the Day" within just your first 5 weeks of joining HubPages. That is amazing. It is actually not easy to get picked for Hub of the Day. I've been here over a year with almost 200 Hubs, and I've never made it to "Hub of the Day". Stunning! Thanks for giving us all a glimpse into an uber exotic Cambodian wedding. You both make an adorable couple and you look beautiful! Congratulations on being voted as The Hub of the Day. With a hub like this, we're not really surprised, are we? Nicely done! This is a beautiful hub and the photos are amazing! Congratulations on Hub of the Day. This was a fantastic hub. Your pictures were so nice, and the attire that you wore was gorgeous. My favorite picture was where your husband was glancing over at you. Priceless! May you have many wonderful years of happiness together. Congrats on Hub of the Day! Thanks for the idea of the culture. I just watched the videos, which I didn't have time to watch the first time I was here. Beautiful! Congratulations of the HOTD award. You deserve it. Congratulations on earning Hub of the Day. You and your husband make a striking couple and all of the ceremonies sounded lovely. I think it's wonderful that you honored both your parents by having tradition ceremonies in addition to the American style ceremony. Interesting and sounds like a very busy time!! But, sounds like fun. The gowns are beautiful!! Beautiful, captivating, interesting, and wonderful. You truly deserved to win Hub of the Day for this one. Congratulations and job well done! I was smitten by the gorgeous pictures in this hub. Talk about beautiful weddings! I do agree with the beautiful comments. You have such a beautiful wedding, its so simple now to understand that your marriage will work beautifully as well. Im a filipino as well and married to a aussie-brit. I love cultures and you've opened up so much information on our asian culture and link that tradition to the modern society. Thanks for sharing and have lots of love..
made me think though, was the cost that big? What an amazing wedding ceremony. You guys are such a cute couple. Lovely pictures and video. Thank you for sharing it. And, Congratulations on Hub of the Day award. So very beautiful. Thank you for sharing. You have done a wonderful job! & Congrats on Hub of the Day! Congratulations sunbun143! So happy for you getting the Hub of the Day! You definitely earned it with this Hub! Awesome! Hey, a Hub wedding would be really fun, wouldn't it? Tee, hee. This is lovely! :) Your wedding looked amazing. I'm half-Korean so I love combining cultures together. You had all three and it's so lovely! Your husband's and your hanboks are so pretty! To respond to the person who said they think "marriage is a gateway to lifelong imprisonment"...umm...I'm sorry you feel that way! But I hope that you have love in your life, no matter the form it takes. Everyone is entitled to their beliefs. To everyone else...thank you for reading, for enjoying, for following, for commenting, for going to my blogs, for sharing even for a moment the joy I felt during my wedding. I wish I could have it again and invite all of you! No really...I love weddings! Let's have a HUB WEDDING! Hehehe....imagine the guestlist. Thanks again! Thanks for sharing your wedding and your culture. I really appreciate your effort to put your wedding tradition in writing and sharing with us. Wow what a way to wake up! Thank you so much to every commenter...your words have really made my day and I just woke up! To be given Hub of the Day, amongst all of you wonderful writers and amazing hubs, I am so honored. Thank you to Hubpages for the honor, and thank you to everyone for reading and enjoying. Hubpages has been a great venue for sharing a little about myself. Thank you for sharing this beautiful event. I feel like I was there with you and your family. Traditions are fascinating - especially when you combine them. All the best for your life together. OMG!! This Hub made me feel soooo happy! You guys all look so beautiful, and I love learning about these joyous celebrations. Also checked out your blog and You Tube. Very nicely written, and well-done. Thanks for the amazing treats you have posted here. Many happy years of love, marriage, laughter, fun and joy. Congratulations on Hub of the Day. (This probably should be Hub of the Year!) Up, awesome, etc --- all. 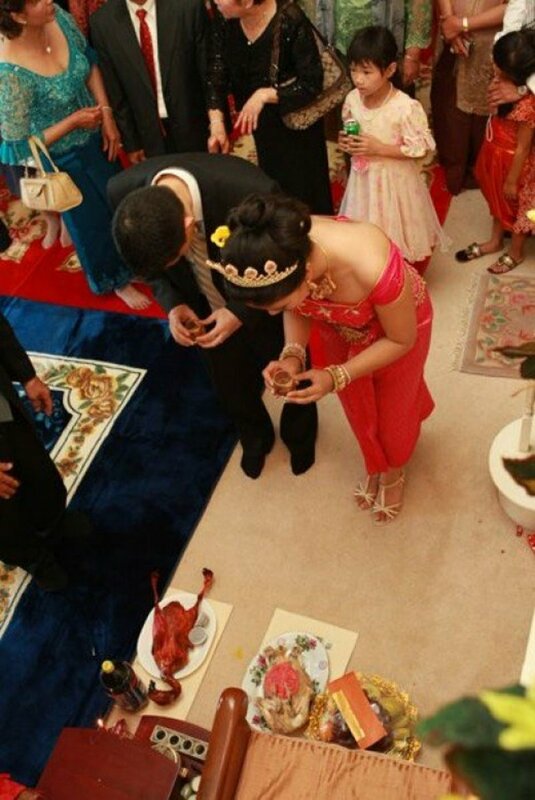 Thanks for sharing this awesome and most interesting Cambodian-Khmer Wedding ceremony of yours. This hub truly deserves to be 'The Hub of the Day'. Congratulations. Sunbum, I wish you all the happiness in the world; may your marriage meet all your expectation. I share this hub of yours with all my friends and relatives in South Africa. Just like me they will find this awesome and enlightening. What a beautiful hub. No wonder it is Hub of the Day! Great pictures and explanation in detail, both wedding ceremonies, Cambodian and Western, were delightful to read about and see. Thanks for sharing your wonderful moments and hubbing about it! God bless! Beautiful pictures. I enjoyed learning about your culture. 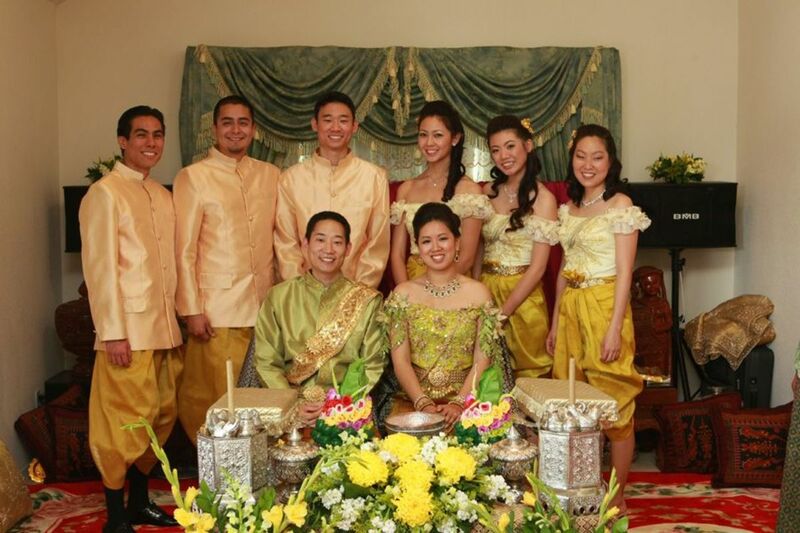 Many Asian countries get married in red but I noticed these couples wore gold. Very handsome clothing. Congratulations! The ceremonies and celebrations seem as elaborate and in certain aspects similar to an Indian wedding ! Wow...I felt as though I was one of the chosen to attend this event. I could see and almost feel the joy!!! I like your pictures. You look beautiful. What a special time! Thank you for sharing your wedding; I had no idea Cambodian wedding ceremonies were so complex. Your photos (and outfits!) are all beautiful. Best wishes for a long and happy marriage. 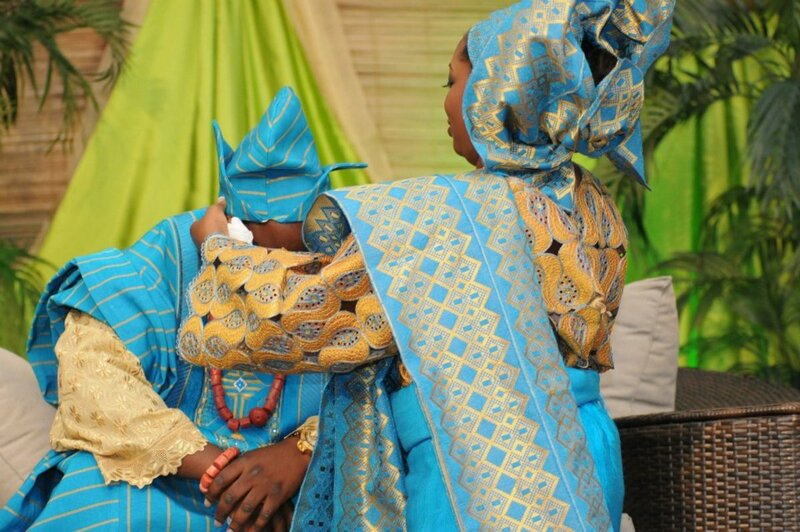 Beautiful photos and well written hub about traditional wedding ceremonies. How i wish i was around to celebrate with you. So very beautiful, thanks for sharing! very nice presentation of wedding you couple are too good made for each other . congress both of you for your future.happy life journey. best of luck. Beautiful hub. Very interesting &lovely photos. Thanks for sharing. Congrats for the hub of the day. I wish you all the very best in your married life. You make a wonderful couple. Great article! Very interesting :) Voted up and awesome!!! I love weddings and yours was very joyful based on the pictures and videos. May it last till death do you part. Thanks for sharing. Congratulations for a hub well written. Simple awesome. You have done a great job. I wish you both a successful marriage life. Cheers! Wow! What a wonderful wedding and lovely photos! It is a very interesting read. I wish you all the best for your marriage. Congratulation for the wedding and congratulation for the hub of the day. Congratulations!! For the 2008 Wedding and the 2012 Hub nugget !! Such gorgeous, colourful, outfits, and wonderful memories! Thanks for this glimpse into Khmer culture! Hehehe thanks JoanVeronica! Congrats on your win! Wholly deserved...and keep at it. Hope we see more of each other in the future. Hi sunbun, I wanted to share something extraordinary! You posted a comment for my hub, (teens as agents of change), and told me you were voting for it for Hubnuggets. At that moment, I had already voted. Then we all got the results for Hubnuggets, and your face looked familiar, so I checked, and lo, I had voted for your hub about the wedding ceremony! So we sort of exchanged votes! At the time, I didn´t stop to leave a comment, but I will now, congratulations and blessings for the future! What a lovely hub you wrote, thanks for sharing! Hey everyone - I just found out I won a Hubnugget award! It's such an honor and an encouragement to keep writing. Thank you for voting, for reading, and just enjoying my hub! Thank you for reading! Re: the heat...the chocolate wrap (similar to fondant) on the top tier of our wedding cake melted right off! Thank goodness my florist/wedding designer did some quick thinking and put fresh rose petals on instead...as you can see from the picture above, it looked intentional and beautiful! Sunbun, That reminds me of my wedding day. It was the hottest day of the year at 98 degrees with a heat index over 100. We had an outdoor wedding and we almost melted before the pictures were finished. This is such a beautiful hub, and people look so happy in the photos! 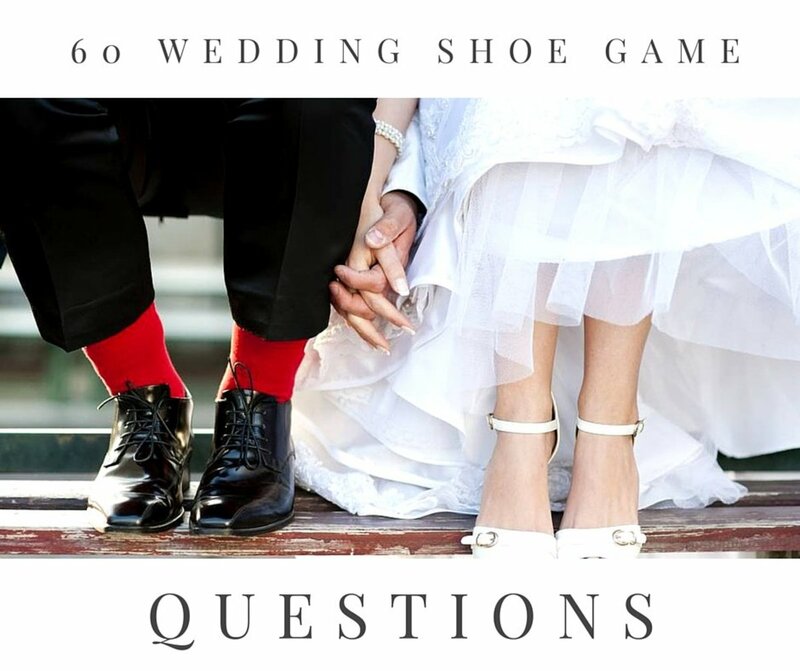 I loved learning about the wedding traditions and seeing how you celebrated the big event. Thank you very much for sharing all the information. Thank you for your kind comments and your interest in my culture. We did indeed have a wonderful wedding, very memorable not only for these ceremonies, but because it was a record-setting 105 degrees that day! But thankfully we had giant electrical air-conditioning fans, lots of cold drinks, and very understanding guests. Thanks for reading! What a beautiful wedding! I almost felt like I was there. The photos are amazing. Thank you for sharing your culture with everyone. So eloquently written and enjoyable! Wow thank you so much! It's nice that veteran hub writers like yourselves consider my article worthy of a nomination! And re: my earlier comment, I'm not normally so cheesy, but I love weddings, and I can't help remembering songs we played like "I Got You Babe" and "More than Words"....cheese at its best, wouldn't you say? Your wedding photos are so beautiful and the two of you make a lovely couple. I can feel the joy emanating through and it is so nice to be part of it when you shared it here. The blending of the traditional and new speaks of your spirit. Thank you so much for sharing this. To add to your celebration is also a nomination here on Hubpages. Your hub has been nominated on the Hubnuggets! You must check it out now...https://pattyinglishms.hubpages.com/hub/Presidents... Best of luck! Oh my goodness!! 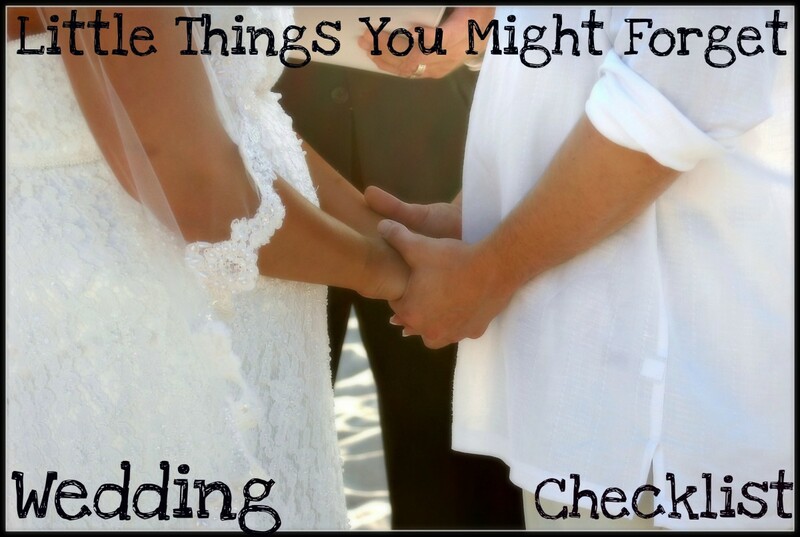 Your wedding was incredible- and it was so much fun reading about all the different ceremonies. How cool!! Thanks so much for sharing the cool background, your personal experience, and the gorgeous photos (and video) with us! Beautiful photos - such a lovely wedding. Beautiful. I love reading about the ceremonies and traditions. The peatures were an extra added bonus. Absolutely awesome. Up, awesome, beautiful, and interesting. Thank you all for your kind comments...I love that our world and even my country of America is so diverse, with so many virtues and traditions that are different and unique. Yet there are so many similarities also that tie us together. Especially..Love! Very beautiful pictures. I really love this hub. It's interesting to know the Khmer culture. There are similarities with Indonesian cuture. Beautiful wedding. Very colorful too. 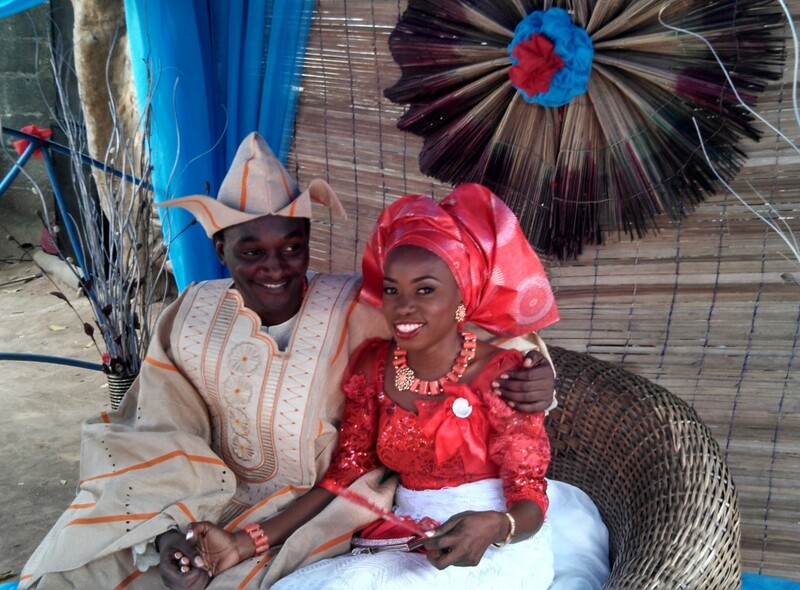 I like that you did both the white and traditional wedding. That's just how we do it in Nigeria too. May your marriage be abundantly blessed. Thanks for sharing. Thank you all for your kind comments. We did have such a good time following traditions, both old and modern, during our wedding. We now have two children (both boys) and looking back at our wedding day and showing them the pictures and slideshows has been fun. I have multiple videos on youtube, and all the pictures are on picasa online. Check out my blogs also for links and more stories about my everyday life and family (listed on my profile). Thank you! This is soooo awesome! You are such an awesome writer and you organize everything so that it is easy and interesting to follow! You did a fine job of explaining each ceremony and adding the Khmer pronunciations is a bonus! Your photos are incredible and you guys look like such a happy couple! I wish you the best of happiness and success as well as good luck for the future! After reading this article, I now know what to expect when I go to Cambodia to have a traditional wedding myself! I am not looking forward to all the kneeling and sitting on the floor (I have bad knees!) but it is definitely worth it! My wife, Mony, and I had a "Sign or Sien" where we prayed to the ancestors and tied the symbolic knot. 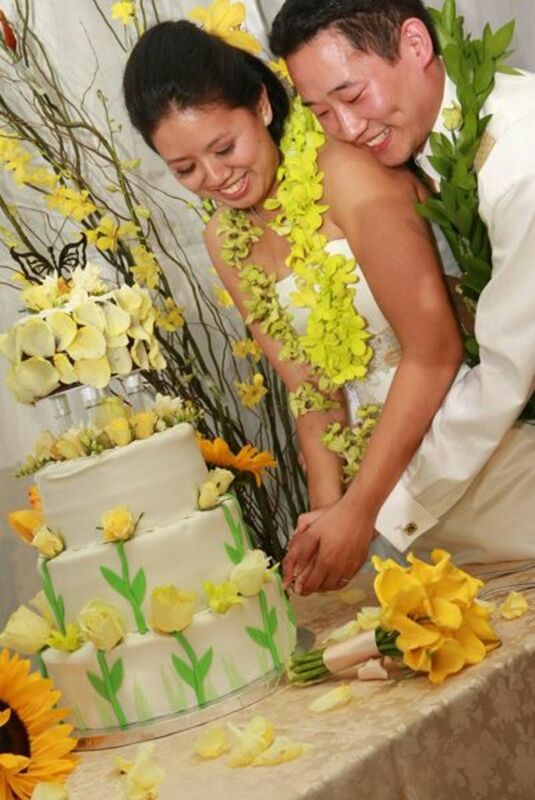 We did this after we were legally married as her family wanted to honor us. It was very interesting and at the time I didn't understand anything the Monk was saying! I remember seeing a pig's head for the first time and we ate a lot of food including Pho (Kitiew). We also received money gifts as well. It was a great experience and I am looking forward to the whole 3 day ceremony. This is really great! You are definitely an asset to the HubPages Community! Keep up the great work! So beautiful! Thanks for sharing this. I think we as Americans sometimes forget that other cultures also have unique and interesting wedding customs. I love the way you honored your culture. Very nice article, I learned alot! Nice that you were about to incorporate different cultural traditions into your ceremony, making it all that more meaningful and special. I enjoyed reading this article and learning about Khmer culture. Seems like everyone had a great time, especially your parents and in-laws. Great pictures. Voted up! This is very similar to our culture, Vietnamese. Thanks for sharing. AWWWWWW....beautiful!!! I love it very much! You both made such a cute couple!! hehe...I'm all red every time I see wedding photo. Its just adorable!! My fiancé and I plan to get married over at Cambodia after we save up enough to bring the whole family up there. By the way, the information is very useful! I vote up, useful, awesome, interesting...and of course BEAUTIFUL! !